Objective The objective was to determine the sensitivity, specificity, and positive and negative predictive values of the CSF Tap Test (CSF TT) and resistance to CSF outflow (Rout) for the outcome of shunting in a sample of patients with idiopathic normal pressure hydrocephalus (iNPH). Methods 115 patients were included in this European multicentre study. Diagnosis was based on clinical symptoms and signs, and MRI changes. All patients were treated with programmable ventriculoperitoneal shunts and re-examined 12 months after surgery. Outcomes were measures with a newly developed iNPH Scale and the modified Rankin Scale (mRS). Before surgery, a CSF TT and measurement of Rout was performed, with the results blinded to all caregivers. The 12 month outcome was correlated with Rout and the result of the CSF TT. Results Rout and the results of the CSF TT showed no correlation with outcome measured by either domain, or with total iNPH score or mRS score. Only an increase in the gait task (10 m of walking at free speed) of the CSF TT correlated significantly (r=0.22, p=0.02) with improvement in iNPH score. The positive predictive value of both tests was >90% and the negative predictive value <20%. Rout >12 had an overall accuracy of 65% and the CSF TT 53%. Combining both tests did not improve their predictive power. No correlation was found between Rout and the results of the CSF TT. Conclusions Rout and the results of the CSF TT did not correlate with outcome after 12 months. Rout and CSF TT can be used for selecting patients for shunt surgery but not for excluding patients from treatment. Trial registration The study has been registered at clinicaltrials.gov, identifier NCT00874198. Supplementary tests are used to predict who will respond to shunting and who will not.13 Two groups of such predictive tests can be distinguished: tests measuring compliance of the craniospinal space or resistance to CSF outflow (Rout)14–16 and tests measuring the effect of temporary drainage of CSF. The Dutch study on the predictive value of Rout17 illustrates the difficulty of using a fixed level of resistance for selection of patients for shunt surgery: a high level implies a high success rate among the operated patients, but will also lead to exclusion of many potential shunt responders. Thirteen centres in nine European countries included 142 iNPH patients (69 women and 73 men) with a mean age of 71±9 (SD) years (range 30–87) between September 2004 and January 2008. Each centre included their patients consecutively. A total of 115 were re-examined 12 months after shunt insertion and provided data for the analyses of prediction presented in this report. The clinical criteria for a diagnosis of iNPHT required a gradually developed gait disturbance affecting tandem walking, turning, stride length and width. For a diagnosis of iNPHQ, less typical gait disturbances were accepted. Patients diagnosed as iNPHT also had to show or experience a mild to moderate cognitive impairment (Mini-Mental State Examination scores ≥21)23 with onset, together with gait disturbance at onset or later, and including impaired wakefulness, slowness and memory deficits. Patients presenting with other cognitive symptoms (eg, aphasia, apraxia or agnosia) or with more severe cognitive deficits (Mini-Mental State Examination scores <21) were classified as iNPHQ. The presence of incontinence or problems with static balance was not necessary for any of the two diagnoses. The MRI criteria for iNPHT were a symmetrical quadri-ventricular enlargement without cortical infarcts or other clinically relevant parenchymal lesions (lacunar infarcts of less than 1 ml were accepted) whereas single cortical infarcts were accepted for a diagnosis of iNPHQ. Mild cortical atrophy and mild leukoaraiosis were allowed for a diagnosis of iNPHT, while moderate cortical atrophy and moderate to severe leukoaraiosis were classified as iNPHQ. Free communication between the ventricular system and the subarachnoid space and an Evans’ Index >0.30 was mandatory for both diagnoses. Patients who were unwilling to participate, had a restricted life expectancy or had contraindications to surgery were excluded, such as patients later found to have an ICP>18 mm Hg. Forty-eight patients were classified as iNPHQ and 67 as iNPHT (table 1). After inclusion but prior to surgery, patients were referred for a combined CSF dynamic test. All personnel involved in the evaluation of the patients were blinded to the test results. The combined CSF dynamic test examined ICP, Rout and the results of the 50 ml CSF TT, and was performed in the following way: a lumbar puncture was performed in the morning with a 0.7 mm needle and mean CSF baseline pressure was registered for 5 min followed by a 12 ml CSF drainage (for CSF biomarker analyses). After the drainage, saline was infused until CSF pressure returned to baseline. After 5 min of rest, a lumbar infusion test was performed using a constant infusion or constant pressure method,14 ,15 ,27 and Rout was calculated in mm Hg/min/ml. After the infusion test was finished, CSF was drained until CSF pressure returned to baseline. Then, a CSF TT of 50 ml18 was performed at approximately 09:00h. Three hours after drainage of CSF, gait was analysed by measuring the number of steps and seconds needed for walking 10 m at free speed. Psychometric performance was analysed using the Grooved Pegboard (Lafayette Instrument Co), measuring manual dexterity as time to fit 25 pegs into holes with randomly positioned slots, and Stroop's Test. Stroop's Test measures colour naming speed and response selection, which requires the patient to name the colours of 100 rectangles as fast as possible and then to name the printed colour of 100 incongruent colour words (eg, the word blue printed in red).28 The response to the CSF TT was expressed as the mean of the per cent change in all motor and psychometric tests compared with the results achieved 24 h previously (the day before the combined CSF dynamic test). A mean increase of 5% was considered significant. All patients were operated on by an adjustable ventriculoperitoneal shunt (Codman & Shurtleff) with an opening pressure set to 120 mm H2O. Patients were re-examined 1 month after operation to ascertain the patency of the shunts by an examination of gait, CT scan or MRI and, if indicated, a shunt function test. Twelve months after surgery, patients were re-examined in the same way as at entry (mRS, iNPH Scale and CT scan). The primary outcome measures were differences between the preoperative and 12 month scores on the iNPH Scale and mRS. Improvement in the iNPH Scale was defined as an increase of 5 points or more and in the mRS as a decrease of 1. The Spearman rank correlation coefficient (ρ) was used to estimate associations between variables, and the Wilcoxon–Mann–Whitney U test and the χ2 test (or Fisher's exact test when more appropriate) were used for comparisons between groups regarding scores and proportions. Forward multiple and logistic regression analyses were done to evaluate the relations between tests and outcome. Statistical analyses were performed with IBM SPSS V.17.0 for Windows; p values were not adjusted for multiple comparisons, partly because of variations in sample sizes and partly to avoid type II errors when the results displayed consistent patterns. Eighty-four per cent of the 115 patients that could be re-evaluated showed an improvement after 1 year (>5 points on the iNPH Scale). The median improvement in total score was 16 points; 18 points for gait, 9 for neuropsychology, 15 for balance and 20 for the continence domain (figure 1). Changes in total and domain scores for 115 idiopathic normal pressure hydrocephalus (iNPH) patients after 1 year of shunt treatment. Sixty-nine per cent of patients showed an improvement on the mRS; 35% were improved by 1 point, 25% by 2 points and 7% by 3 points. The proportion of patients able to live independently (scores 0–2 on the mRS) was increased from 53% before surgery to 82% 12 months after surgery (figure 2). Changes in modified Rankin Scale (mRS) scores 1 year after shunt insertion. CSF baseline pressure at entry was 10.0 mm Hg (SD=3.8; range 2–18). Mean Rout at entry was 16.0 mm Hg/ml/min (SD=6.4; minimum 6.0 and maximum 35 mm Hg/ml/min, distributed as shown in figure 3). Rout in the idiopathic normal pressure hydrocephalus (iNPH) (n=115) patients. Frequency expresses number of patients. The mean improvement in gait and mental function after 50 ml of CSF drainage was 9.1% (SD=20), with a range between deterioration of 28.5% and improvement of 102%; 50% of patients improved significantly (>5%) (figure 4). Per cent improvement in motor and psychometric tasks after a CSF Tap Test in 115 idiopathic normal pressure hydrocephalus patients (iNPH). Frequency expresses number of patients. Rout did not correlate with iNPH Scale score at entry whereas the effect of performing the CSF TT was negatively correlated with iNPH score (r=−0.26, p=0.006). Rout (figure 5) and the effect of performing the CSF TT (figure 6), obtained from the combined CSF dynamic test, showed no significant correlation with outcome, measured by either domain, or with total iNPH scores or mRS scores. 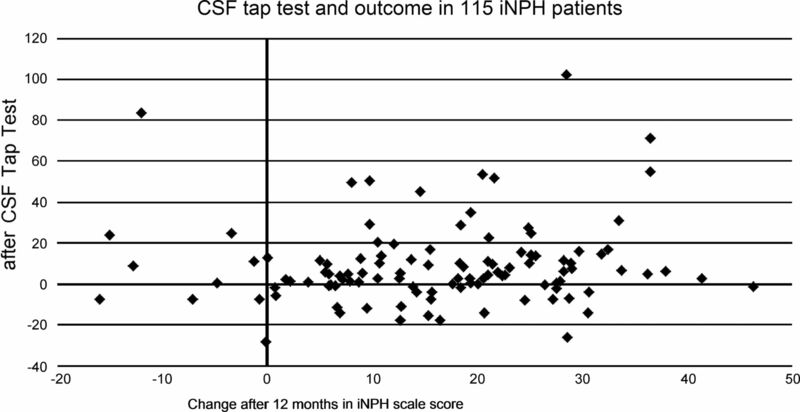 The best correlation (r=0.15, p=0.06) was seen between outcome in iNPH score and the effect of performing the CSF TT. Increase in the gait tasks (10 m of walking at free speed) of the CSF TT correlated significantly (r=0.22, p=0.02) with improvement in iNPH score but not with improvement on the mRS. No correlation was found between Rout and the effect of performing the CSF TT (r=0.19, p=0.42). 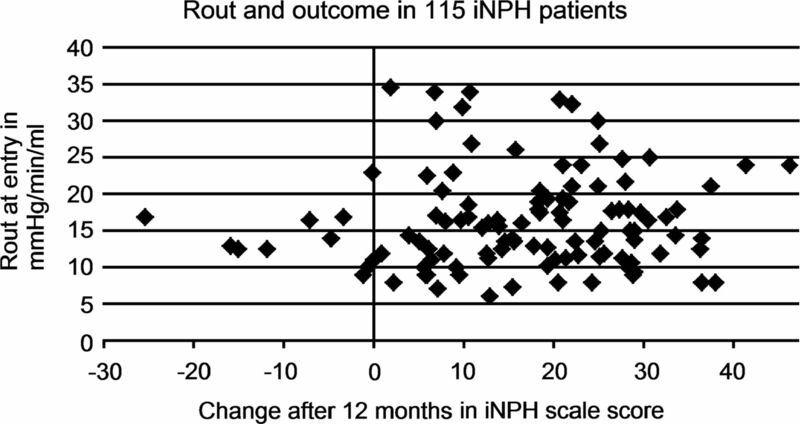 Correlation between outcome measured by the idiopathic normal pressure hydrocephalus (iNPH) Scale and Rout before shunt surgery. Relation between outcome measured by the Idiopathic Normal Pressure Hydrocephalus Scale (iNPH) and the effect of the preoperative CSF Tap Test. Sensitivity, specificity, and positive and negative predictive values and accuracy of the CSF TT measurement and different cut-off values for Rout and combinations thereof are shown in table 2. Similar numbers were achieved using the mRS for evaluation of outcome (not shown). The likelihood ratio of Rout >18 mm Hg/min/ml was 2.6 and of the CSF TT 1.3. The consequences of using different Rout (mm Hg/min/ml) and CSF TT limits for selection of patients for shunt surgery are shown in table 3. No differences were found between iNPHQ and iNPHT concerning the prediction of outcome of Rout and CSF TT. Regression analyses showed that neither Rout nor the effect of performing the CSF TT could explain outcome measured by either the iNPH Scale or mRS. This first large prospective blinded study on values for Rout and CSF TT for predicting the effect of shunt surgery in iNPH clarifies some practical issues and illuminates the pathophysiological aspects of both methods. Quite surprising was the finding that the diagnostic accuracy of both tests was the same for patients with typical and questionable iNPH. We previously reported that outcome was more or less the same in both groups.7 One might expect a better predictive power of Rout and CSF TT in patients with iNPHT because the disturbed CSF dynamics are supposedly more important than in iNPHQ patients for whom brain tissue pathology is thought to play a greater role. The lack of difference between the two diagnostic groups is not explained by differences in the proportions of patients who were lost to follow-up, which were similar (16% and 23%, respectively). This result shows again our limited understanding of the physiological effects of shunting. Rout measures the resistance of an extra load of fluid on the absorption mechanism, and increased Rout is a characteristic feature of iNPH pathophysiology.13 In this study, the mean Rout of 16 mm Hg/ml/min was well above the upper limit of normal Rout, as reported by Ekstedt,33 who found the 95th percentile of healthy individuals is 11.5 mm Hg/ml/min. According to a more recent article by Malm et al,34 the upper limit for normality (in this case the 90th percentile) is 17.4 mm Hg/ml/min, a value surpassed by no more than 34% of our patients. The description of a normal reference interval that to such an extent overlaps with the distribution of Rout values among our patients, indicates that the contribution of the pathological factors involved in iNPH may give rise to too small changes in Rout for them to reflect disease severity in correlational analyses. Rout has been used for many decades for predicting outcome after surgery. The constant infusion14 and constant pressure methods27 are well established and also recommended in a recent review.15 Different levels of Rout, varying between 8 and 18 mm Hg/ml/min,17 ,35 ,36 have been suggested as predictors of good outcome with positive predictive values between 75% and 92%, similar to the finding in this study. However, in this study, increased Rout was not related to the degree of reversibility. This was demonstrated by earlier unblinded studies showing no or only weak correlations between Rout and outcome.21 ,37 Other studies support an increased Rout as indicative for good outcome of shunting.22 ,38 ,39 Many of the studies on the predictive value of Rout have been performed on patient groups that included mostly shunt responders, thus making calculation of the predictive values meaningless. The multicentre character of our study may have influenced the reliability of the Rout values. Although all participants used constant flow infusion and one of us (JTTT) recalculated Rout from the original pressure curves, the participants did not use exactly the same recording equipment and measuring techniques. The results therefore reflect the practical situation of Rout measurement in Europe. It was expected that the effect of performing the CSF TT should have shown a relationship with outcome as it mirrors the function of a shunt. The effect of performing the CSF TT has been reported as having approximately one-third of the effect seen after shunt implantation.19 However, this study does not support the notion of any simple relation between CSF TT and outcome. The only significant correlation was between the improvement in gait at the CSF TT and outcome, and this was at a very low level (r=0.22). The first report on the predictive value of the CSF TT draining 50 ml of CSF18 ,19 was promising, while later studies,21 ,22 ,40–42 draining different amounts of CSF, have shown variable results, with a mean accuracy of approximately 50%. In the iNPH guidelines, it was concluded that a negative test should not exclude patients from shunt surgery.13 In this study, we found a similar accuracy of 53% using a limit of improvement after the CSF TT of 5%. If we had applied a limit of 10% improvement, it would have been lower (41%). The CSF TT is considered of high value in some centres and included as a part of the classification of iNPH in the Japanese guidelines on iNPH.43 It seems that the predictive value of the CSF TT is higher in single centres reports,19 ,22 ,39 indicating that the methodology in our study was suboptimal. Although we had planned a rigid regimen for the whole CSF dynamic investigation, regulating all parts of the procedure, some centres performed parts of the procedure in different, sometimes suboptimal, ways. In particular, they did not always succeed in draining the full 50 ml of CSF. The authors were surprised to notice that some patients deteriorated substantially after the tapping, something that we have not experienced previously. Another reason for the lack of correlation (or low correlation if one considers the relation between improvement in the gait domain at the CSF TT) is the regimen itself. Performing Rout measurements prior to the CSF TT might have influenced the test results as the additional volume load could have had a negative impact on the efficiency of the CSF drainage. It might have been better to wait several days between the two examinations but that would have been impossible for practical and economic reasons. Alternatively, an ELD immediately following the infusion might have revealed an improvement as the negative effect of the extra load would gradually wane. Another factor contributing to the low or non-existent correlation might be that we did the evaluation 3 h after drainage without repetition. Virhammar et al44 have shown that only 33% of iNPH patients show constant improvement over 2–24 h after a CSF TT, varying between 44% improved after 4 h and 70% after 8 h.
One important result is that neither the CSF TT nor Rout, or the two in combination, can be used for excluding patients with symptoms and signs of iNPH and compatible MRI changes from shunt surgery. This result confirms what has been found in previous open studies. Also, the power of both tests to predict a good outcome of shunting was disappointingly limited. The positive predictive values of CSF TT and Rout were high but that was simply due to the fact that 84% of patients showed an improvement after the shunt procedure which gives a positive predictive value of 84% simply by chance. The positive predictive value is defined as the proportion of patients with a positive test who were improved after shunting, given by the calculation: patients with positive test combined with postoperative improvement/(positive test combined with postoperative improvement+positive test combined with the absence of postoperative improvement. With a 50-50 result of the test, the quote would thus be 42/(42+8)=0.84. In fact, in half o the cases the positive predictive value will always be equal to the proportion of improved patients. Unfortunately, the negative predictive values were all very low; the percentage of patients improving after a negative test is almost as high as after a positive test at the limits we used. This problem is well known from previous single studies on Rout36 and CSF TT.19 One reason for performing a Rout measurement as well as a CSF TT was to investigate whether false negative results occur in the same or in different patients. Combining the results of both tests in a logistic regression analysis did not yield an algorithm with improved predictive power. Due to our improved knowledge of the clinical picture and MRI criteria as well as the use of an outcome scale that better reflects the pertinent clinical features, 84% of patients improved after shunting. We conclude that routinely performing a lumbar spinal infusion test and a CSF TT does not provide enough added value to select patients for shunting. However, if the clinical or MRI findings raise any doubts, the CSF TT remains a useful tool, particularly the changes in gait and, in case of a negative result, a measurement of Rout would still be helpful in finally deciding whether or not to suggest shunting. Rout and the effect of performing the CSF TT do not correlate with outcome after 12 months. Rout and CSF TT can be used for selecting patients for shunt surgery but not for excluding patients from treatment. We wish to express our gratitude towards the participating investigators and their respective centres for contributing to this study with their knowledge, time and effort. Thus thanks go to: Michael Kiefer, Department of Neurosurgery, Saarland University, Homburg-Saar, Germany; Ulrich Meier and Johannes Lemcke, Department of Neurosurgery, Akademisches Lehrkrankenhaus der Freien Universität Berlin, Krankenhaus Berlin-Marzahn, Berlin, Germany; Vincenco Paternó and Lennart Stieglitz, Department of Neurosurgery, International Neuroscience Institute Hannover, Hannover, Germany; Willem van der Meulen, Department of Neurology, Medical Centre Haaglanden, The Hague, The Netherlands; Martin Sames and Karel Saur, Department of Neurosurgery, Masaryk Hospital, Usti nad Labem, Czech Republic; Mariann Kordás and Dusan Vitanovic, National Institute of Neurosurgery, Budapest, Hungary; Andreu Gabarrós, Hospital Universitari de Bellvitge, Neurosurgery Department, Feixa Llarga s/n, L'Hospitalet de Llobregat, Barcelona, Spain; Domenico d'Avella, Department of Neurosurgery, University of Padova, Padova, Italy; Michael Triffaux and Alain Tyberghien, Service de Neurochirurgie, Clinique au Jardin Botanique 32, Brussels, Belgium; Marianne Juhler, Department of Neurosurgery, Rigshospitalet, Copenhagen University Hospital, Denmark and Steen Hasselbalch, Memory Disorders Clinic, Department of Neurology, Rigshospitalet, Copenhagen University Hospital, Denmark; Kristina Cesarini and Katarina Laurell, Neurologiska kliniken, Akademiska Sjukhuset, Uppsala, Sweden. We are grateful to Bernd Kischnik for database management.
. The special clinical problem of symptomatic hydrocephalus with normal cerebrospinal fluid pressure. Observations on cerebrospinal fluid hydrodynamics. J Neurol Sci 1965;2:307–27.
. Diagnosing idiopathic normal-pressure hydrocephalus. Neurosurgery 2005;57(Suppl 3):S4–16.
. Self-reported functional outcome after surgical intervention in patients with idiopathic normal pressure hydrocephalus. 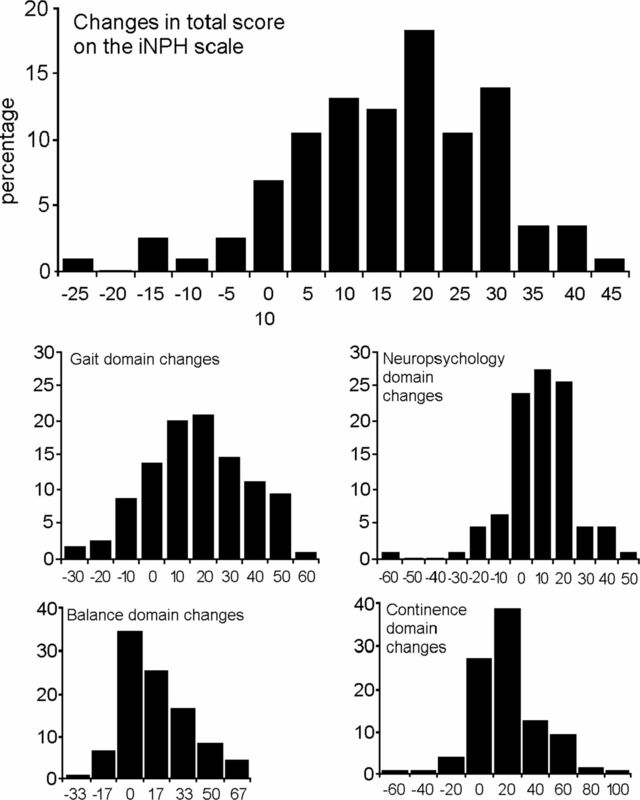 J Clin Neurosci 2011;18:649–54.
. Diagnostic intracranial pressure monitoring and surgical management in idiopathic normal pressure hydrocephalus: a 6-year review of 214 patients. Neurosurgery 2010;66:80–91.
. Diagnosis of idiopathic normal pressure hydrocephalus is supported by MRI-based scheme: a prospective cohort study. Cerebrospinal Fluid Res 2010;7:18.
. One-year outcome in the European multicentre study on iNPH. Acta Neurol Scand 2012;126:14553.
. Improved outcome in shunted iNPH with a combination of a Codman Hakim programmable valve and an Aesculap-Miethke ShuntAssistant. Cent Eur Neurosurg 2010;71:113–16.
. Perioperative risk factors for short term shunt revisions in adult hydrocephalus patients. J Neurol Neurosurg Psychiatry 2009;80:1248–53.
. Five-year incidence of surgery for idiopathic normal pressure hydrocephalus in Norway. Acta Neurol Scand 2009;120:314–16.
. Prevalence of possible idiopathic normal-pressure hydrocephalus in Japan: the Osaki-Tajiri project. Neuroepidemiology 2009;32:171–5.
. Asymptomatic ventriculomegaly with features of idiopathic normal pressure hydrocephalus on MRI (AVIM) in the elderly: a prospective study in a Japanese population. J Neurol Sci 2009;277:54–7.
. The value of supplemental prognostic tests for the preoperative assessment of idiopathic normal-pressure hydrocephalus. Neurosurgery 2005;57(Suppl 3):S17–28.
. A simple constant-infusion manometric test for measurement of CSF absorption. I. Rationale and method. Neurology 1970;20:534–44.
. Assessment of cerebrospinal fluid outflow resistance. Med Biol Eng Comput 2007;45:719–35.
. CSF outflow resistance and pressure-volume index determined by steady-state and bolus infusions. Clin Neurol Neurosurg 1985;87:159–65.
. Dutch normal-pressure hydrocephalus study: prediction of outcome after shunting by resistance to outflow of cerebrospinal fluid. J Neurosurg 1997;87:687–93.
. The clinical effect of lumbar puncture in normal pressure hydrocephalus. J Neurol Neurosurg Psychiatry 1982;45:64–9.
. Normal pressure hydrocephalus. Predictive value of the cerebrospinal fluid tap-test. Acta Neurol Scand 1986;73:566–73.
. Diagnosis and management of idiopathic normal-pressure hydrocephalus: a prospective study in 151 patients. J Neurosurg 2005;102:987–97.
. The predictive value of cerebrospinal fluid dynamic tests in patients with the idiopathic adult hydrocephalus syndrome. Arch Neurol 1995;52:783–9.
. Comparison between the lumbar infusion and CSF tap tests to predict outcome after shunt surgery in suspected normal pressure hydrocephalus. J Neurol Neurosurg Psychiatry 2002;73:721–6.
. Cerebral vascular accidents in patients over the age of 60. II. Prognosis. Scott Med J 1957;2:200–15.
. Recovery of motor function after stroke. Stroke 1988;19:1497–500.
. A new scale for assessment of severity and outcome in iNPH. Acta Neurol Scand 2012;126:22937.
. CSF hydrodynamic studies in man. 1. Method of constant pressure CSF infusion. J Neurol Neurosurg Psychiatry 1977;40:105–19.
. Stroop, the bewildering effect (in Swedish). Svensk Neuropsykologi 2001;13:12–15.
. Idiopathic normal pressure hydrocephalus: increased supplementary motor activity accounts for improvement after CSF drainage. Brain 2008;131:2904–12.
. Reduced thalamic N-acetylaspartate in idiopathic normal pressure hydrocephalus: a controlled 1H-magnetic resonance spectroscopy study of frontal deep white matter and the thalamus using absolute quantification. J Neurol Neurosurg Psychiatry 2011;82:772–8.
. Pattern of white matter regional cerebral blood flow and autoregulation in normal pressure hydrocephalus. Brain 2004;127:965–72.
. Normal pressure hydrocephalus and cerebral blood flow: a PET study of baseline values. J Cereb Blood Flow Metab 2004;24:17–23.
. CSF hydrodynamic studies in man. 2. Normal hydrodynamic variables related to CSF pressure and flow J Neurol Neurosurg Psychiatry 1978;41:345–53.
. Reference values for CSF outflow resistance and intracranial pressure in healthy elderly. Neurology 2011;76:903–9.
. The predictive value of conductance to outflow of CSF in normal pressure hydrocephalus. Brain 1982;105:65–86.
. Cerebrospinal fluid shunt dynamics in patients with idiopathic adult hydrocephalus syndrome. J Neurol Neurosurg Psychiatry 1995;58:715–23.
. Assessment of idiopathic normal pressure patients in neurological practice: the role of lumbar infusion testing for referral of patients to neurosurgery. Eur J Neurol 2008;15:605–12.
. Does CSF outflow resistance predict the response to shunting in patients with normal pressure hydrocephalus? Acta Neurochir Suppl 1998;71:331–3.
. Indications for shunting in patients with idiopathic normal pressure hydrocephalus presenting with dementia and brain atrophy (atypical idiopathic normal pressure hydrocephalus). Neurol Med Chir (Tokyo) 2000;40:38–46.
. Predictive value of temporary external lumbar drainage in normal pressure hydrocephalus. Neurosurgery 1988;22:388–91.
. The value of temporary external lumbar CSF drainage in predicting the outcome of shunting on normal pressure hydrocephalus. J Neurol Neurosurg Psychiatry 2002;72:503–6.
. Clinical significance of cerebrospinal fluid tap test and magnetic resonance imaging/computed tomography findings of tight high convexity in patients with possible idiopathic normal pressure hydrocephalus. Neurol Med Chir (Tokyo) 2010;50:119–23.
. Guidelines for management of idiopathic normal pressure hydrocephalus. Neurol Med Chir (Tokyo) 2008;48(Suppl):S1–23.
. 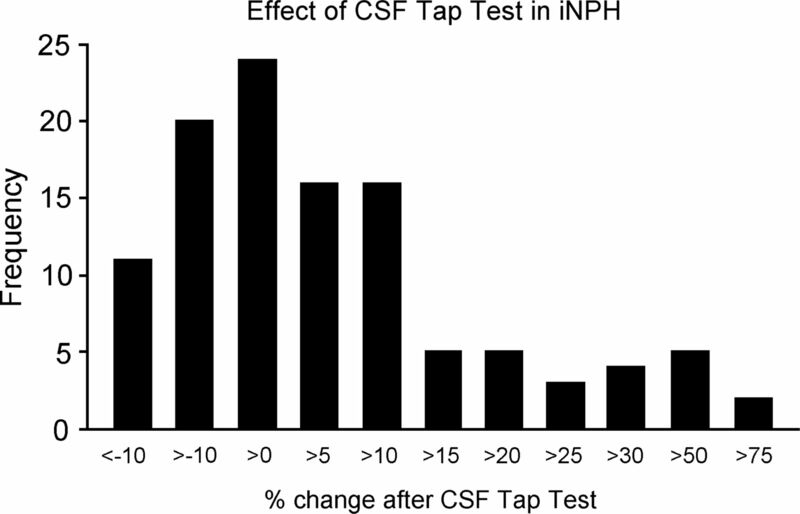 The CSF tap test in normal pressure hydrocephalus: evaluation time, reliability and the influence of pain. Eur J Neurol 2012;19:271–6. Contributors All authors contributed to the conception and design, or analysis and interpretation of the data, to drafting of the article or revising it critically for important intellectual content, and gave final approval of the version to be published. CW, PMK and JTTT designed and supervised the study. Data were collected by the investigators acknowledged above. CW and PH extracted and analysed the data. CW, JTTT and PH interpreted the data. CW wrote the first draft of the manuscript. All authors contributed to subsequent versions of the manuscript. Funding The study was supported by Codman & Shurtleff, Raynham, Massachusetts, USA. Support was granted for equipment, study logistics and to cover the costs of standard of care and data collection at the investigator site. The funder had no role in actively influencing the design, concept or management of the scientific aims of the study. Competing interests CW receives honorarium for lecturing and consulting from Codman & Shurtleff and Likvor AB. PMK was a medical consultant for Codman & Shurtleff during the time of the study. Ethics approval All procedures were performed according to the Declaration of Helsinki. The study was approved by the local ethical committees at all participating centres.